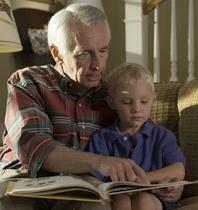 The path to success in school and life begins in the critical years between birth and age 5. Family, community and school all play significant roles in making sure children enter kindergarten ready to learn. All children entering school will exhibit the knowledge and the social and developmental skills needed for success in first grade. 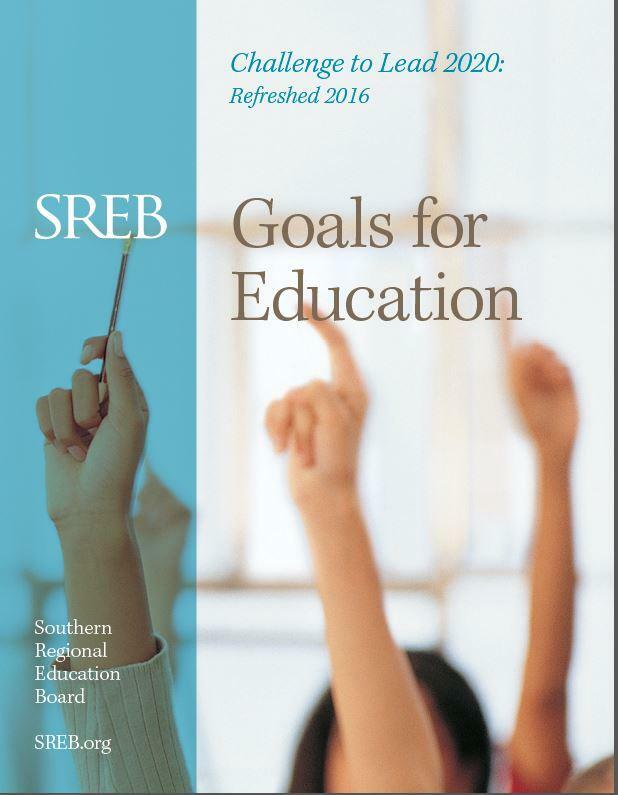 Track your state’s progress toward this goal in SREB’s State Progress Reports. 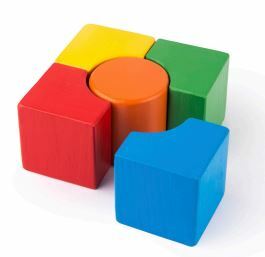 All the pieces matter for strong state policy in early childhood education. To build a sound educational foundation for all children, state policy should center on high-quality programs with great teachers. Policy also should address governance, accountability and access. 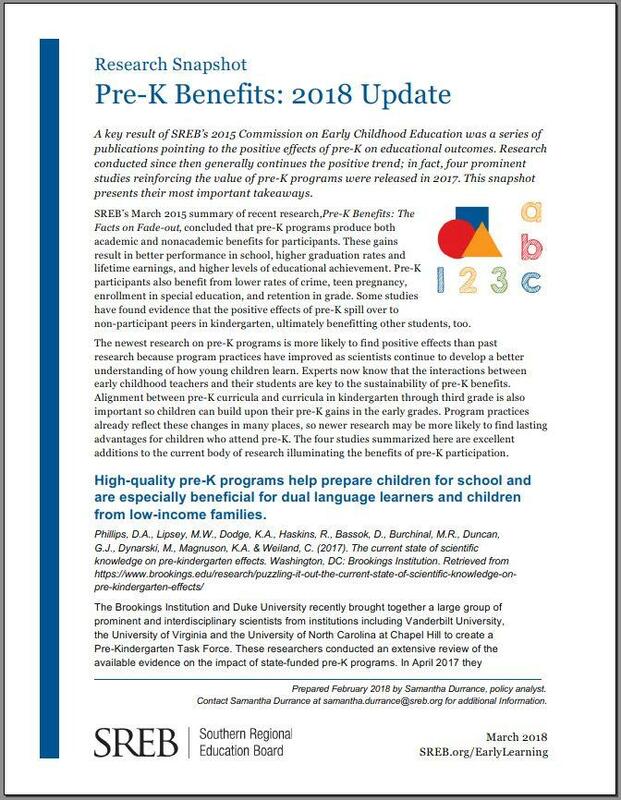 This snapshot summarizes important takeaways from four research studies published in 2017 that reinforce the value of pre-K. High-quality pre-K programs help prepare children for school, especially dual language learners and children from low-income families. Head Start programs can disrupt the cycle of poverty. And pre-K shows effects on outcomes such as math achievement and the likelihood of graduating from high school. Researchers continue to examine the long-term impacts of pre-K participation, and more sophisticated methods and better data may help solidify the consensus that has already emerged: investing in early childhood education plays an important role in preparing young children for success in the early grades and pays off in the long run. The Commission calls for states to raise the quality of early education programs and ensure they are well-coordinated across different agencies and budgets. The recommendations cover wider access and accountability for results. The report also sheds light on the need for a statewide policy framework to bring together public and private funding currently spread across agencies and budgets. As policymakers adopt policies for pre-K programs, they want to know that the programs are effective. Do the gains last? Here’s what we know. 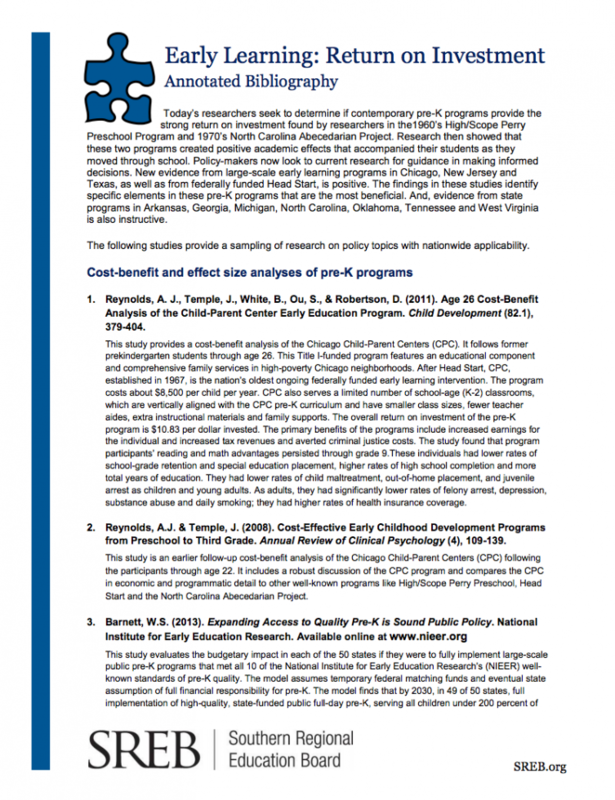 Findings in these studies identify specific elements in pre-K programs that are most beneficial. 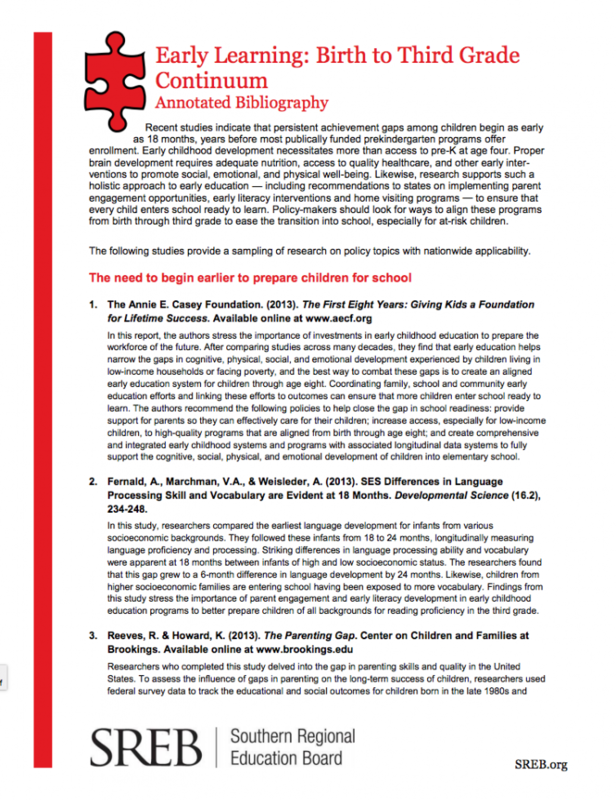 Evidence from state programs in Arkansas, Georgia, Michigan, North Carolina, Oklahoma, Tennessee and West Virginia is also instructive. Studies provide a sampling of research on policy topics with nationwide applicability. Catch up vs. fade out: Do pre-K’s positive effects persist through K-12? 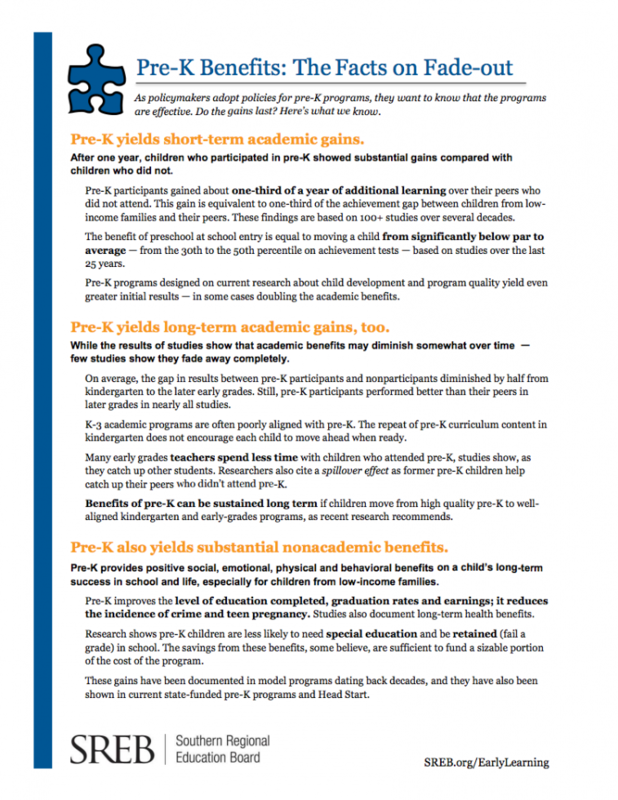 Recent studies indicate that persistent achievement gaps among children begin as early as 18 months, years before most publicly funded prekindergarten programs offer enrollment. 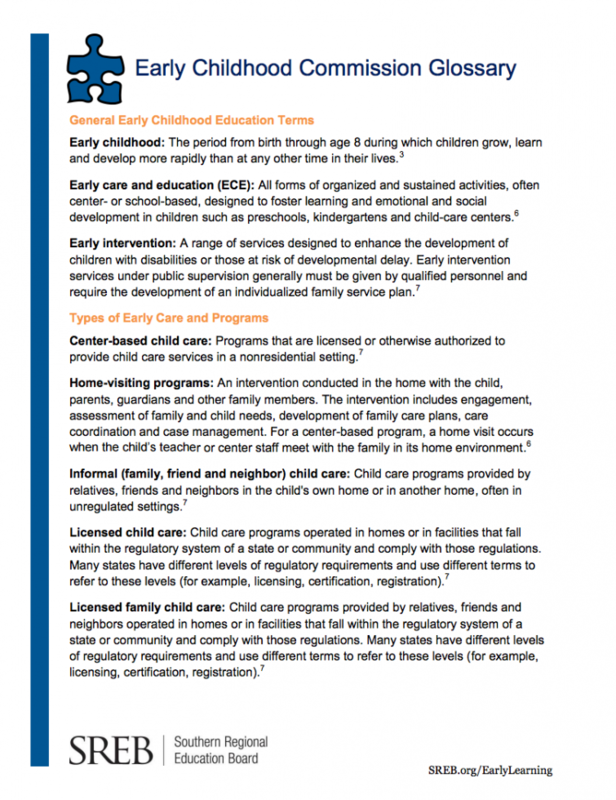 Early childhood development necessitates more than access to pre-K at age four. Proper brain development requires adequate nutrition, access to quality healthcare, and other early interventions to promote social, emotional, and physical well-being. Likewise, research supports such a holistic approach to early education — including recommendations to states on implementing parent engagement opportunities, early literacy interventions and home visiting programs — to ensure that every child enters school ready to learn. Policy-makers should look for ways to align these programs from birth through third grade to ease the transition into school, especially for at-risk children. The following studies provide a sampling of research on policy topics with nationwide applicability. 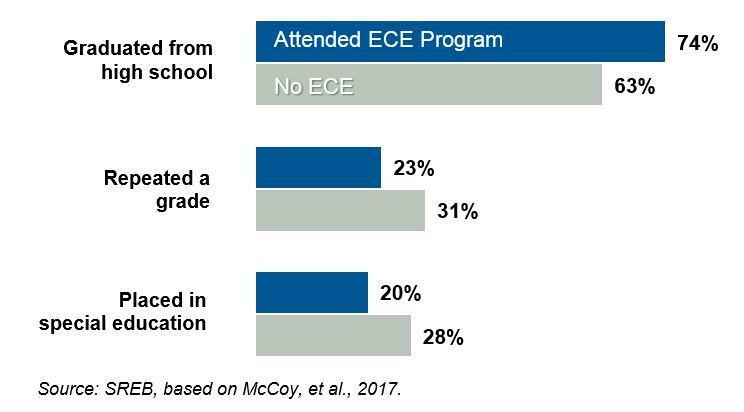 Overwhelmingly, research shows that program quality is a major determinant in the achievement gains for young children who participate in early education programs. Teacher quality, in particular, is closely related to positive educational outcomes for preschool participants. Research shows that children in programs whose lead and supporting teachers have higher education qualifications and ongoing professional development show the greatest gains. Also, research shows that the use of developmentally appropriate curricula predicts program quality, as does a high degree of direct instruction that comes from smaller staff-child ratios and focused small group activities. 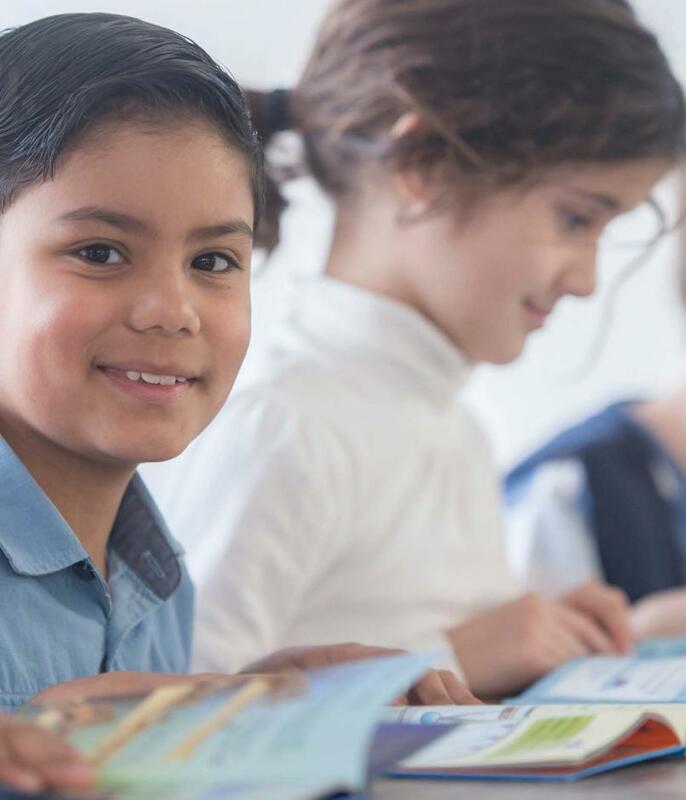 Evidence suggests that these positive outcomes benefit a diverse range of children from various racial, ethnic, and socioeconomic backgrounds. 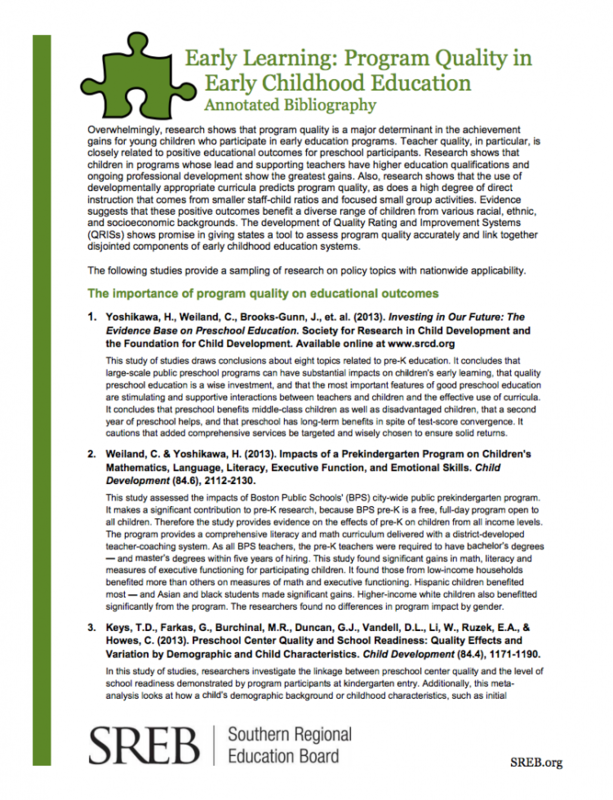 The development of Quality Rating and Improvement Systems (QRISs) shows promise in giving states a tool to assess program quality accurately and link together disjointed components of early childhood education systems. 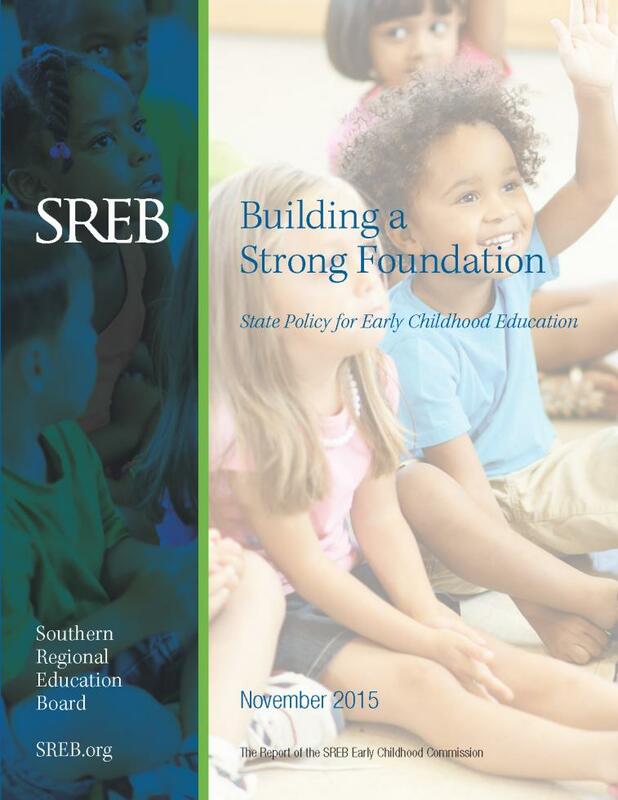 This brief traces the evolution of research on state-funded pre-K programs. While a few older studies gave rise to and perpetuated a fade-out theory, recent research has produced evidence that children can sustain the gains made during the pre-K year. 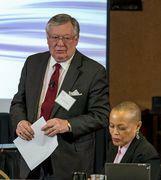 Challenge to Lead 2020 Goals for Education: Refreshed 2020 offers six critical goals. 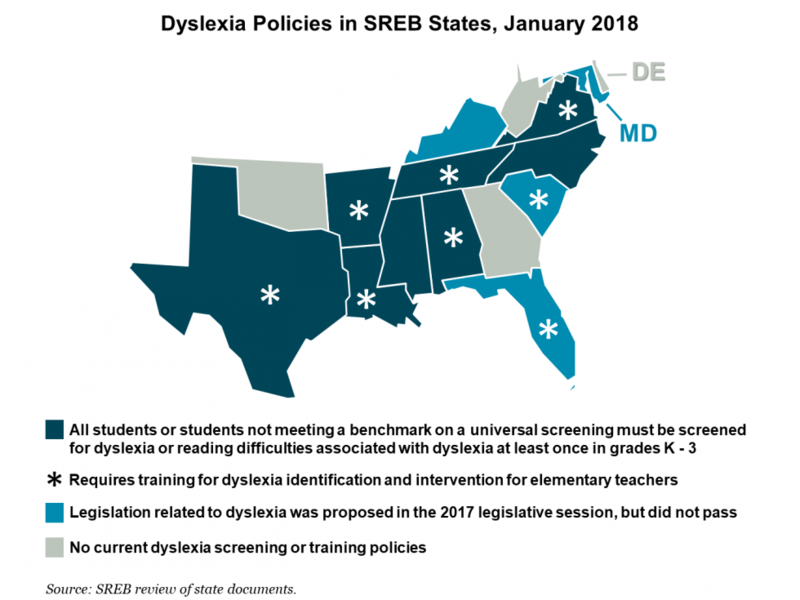 They were designed to help SREB state leaders connect measures of student achievement to essential state policies. Each goal includes background information and the steps states need to take to meet each goal in the years ahead. Our understanding about early childhood development has grown by leaps and bounds in recent years. New brain research tells us that children’s brains form very rapidly early on, and their earliest experiences have lifelong effects on their likelihood to succeed. Now it’s time to put what we’ve learned into practice so that our young children get the best start possible. What happens in a child’s first three years of life has deep and long-lasting implications for success in school and life. Studies show that how many words children are exposed to by age 3, their mothers’ education level, and the stress of poverty are huge factors in whether or not they are ready for kindergarten at age 5. 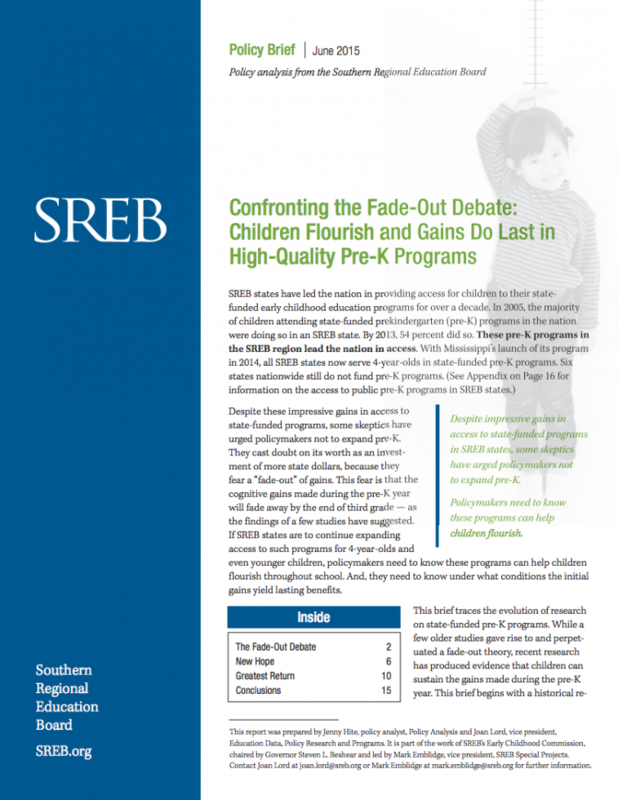 Brief brings together the research on "fade-out"
The body of research on benefits of pre-K shows that quality is key to long-term gains and that early investments yield larger returns, especially for high-risk children.